It's Capacity is 23 Ltrs.It has 81 Auto Cook Menus.The Vapor Clean Function of This microwave harnesses the cleansing power of water vapor in removing stains and grime from your microwave's inner cavity. All you need to do is press the Vapor Clean button. Just wipe the cavity once the Vapor Clean action has been completed. And there you have it, a spick and span microwave cavity free from bacteria and bad odours. It Also has Child Lock for Extra Safety. Customized Ducts on the cavity ceiling help in 360 Degree Distribution of Heat Waves delivering perfect cooking results. 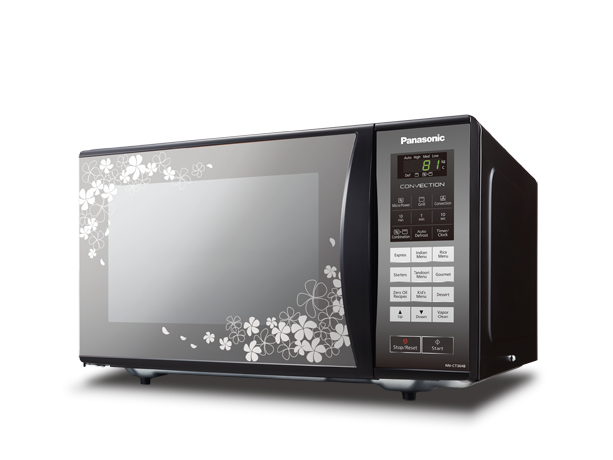 To Recieve updates and possible rewards for Panasonic NN-CT364B please sign in. To Recieve updates and possible rewards for Microwave please sign in.